Here at Halton UK, we’re committed to valuing and celebrating every player's unique strengths: we're all about the power of sport to help individuals become the best they can be. Everyball Enabled, the disability tennis programme here at Halton, is an important part of what we do. I recently sat down with Tom Mayer, the volunteer who runs Everyball Enabled Tennis. I started off by asking why he's volunteering and what brought him to Halton. "The programme was started in 2011 by Tom Wood, but when he moved away there was a gap. Someone needed to take over running the programme, and I thought that was something I could do quite easily as it fit with my skill sets and interests. "I have a son with Down's Syndrome, who takes part in the Saturday tennis sessions here. Daniel doesn't like lots of athletic activities -- despite having three brothers who are all sports fiends -- but he just loves the people here, the coach, the other kids. The sessions are a fun, safe space for him to go and play tennis. Although, really, it has nothing to do with tennis -- tennis is just the vehicle we use to provide all sorts of other things." What's on offer at Halton UK for players with disabilities? "Every week, we run a range of different sessions. DS Active Tennis offers young people with Down's Syndrome a chance to play, learn and socialise. The sessions are promoted through the Down's Syndrome Association, but are -- in the spirit of all our sessions -- open to children with other disabilities, too. "There's also visually impaired tennis. Around six or seven visually impaired adults play using a specially-adapted ball with a small rattle inside, meaning they have to listen for the ball. That happens weekly, too, as well as open sessions for adults with disabilities or special needs of any kind, too. "We also work with the South Bucks Partnership, a dozen or so special schools from across Buckinghamshire -- to host a mini two-hour festival of tennis every four to six weeks. We usually end up with between forty and sixty kids from half a dozen schools, with needs ranging from cerebral palsy to Down's Syndrome -- and pretty much everything in between. We're lucky, too, in that we're able to signpost wheelchair players to the coach at Stoke Mandeville, Phil Hill, and all the great facilities there." "Halton UK is a registered charity, and the commitment to disability tennis -- to inclusive tennis -- is at the very heart of that. The sessions are heavily subsidised so that they're as affordable as we can make them for the players and their families. "All this amazing disability tennis provision at Halton costs around £10k every year, so we're always looking for support and grants to help make that happen." Who's the disability tennis coach at Halton? "Alex Barnes from Everyball Tennis. He's a young coach, but very experienced for his age, and an excellent performance tennis player. The main thing is, though, he's really patient and happy -- and the kids love him. He's gifted -- he's just got that indefinable 'thing' about him. He's a caring person and people pick up on that. It's expressed in all those ways that are so hard to quantify. But all the Everyball coaches here at Halton are committed to supporting inclusion across the board." What do the disabled players get out of all this? "To start with, it's good exercise -- my son Daniel, for example, is loathe to exercise otherwise. But he also gets a chance to come down and socialise in a really safe environment. It's safe physically -- there are no main roads to cross to get here. And it's safe in terms of the community of people down here. Being here helps him be more confident in other areas of his life, and that's true for the other participants too. "They're so used to seeing people with various disabilities around that it's not a surprise to anyone. Integration helps both ways: it's not only good for people with the disabilities, but it's also good for us as a community as well. Helping people feel comfortable about disability is at least half the battle. 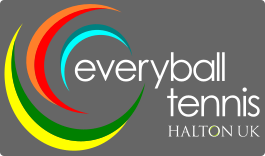 "The ultimate form of inclusive tennis is when people with disabilities join in with mainstream play and activities -- and we already have that at Halton in a number of ways. We have a wheelchair player who joins in mainstream sessions, playing with and against non-disabled player, as well as a number of adults with various other disabilities who come and join in the mainstream sessions and thrive there." "I come down to play and I bring all my four boys with me. It's such a family-friendly place with such a range of activities and spaces on offer. Halton UK is definitely much more than an old-fashioned members club. There's a real small-town feel to the place -- it's open, inclusive, and an excellent community resource. I just wish more people knew about all we offer here. For more information, please email Tom or Alex.